Francis Ysidro Edgeworth FBA (8 February 1845 – 13 February 1926) was an Anglo-Irish philosopher and political economist who made significant contributions to the methods of statistics during the 1880s. From 1891 onward, he was appointed the founding editor of The Economic Journal. Edgeworth was born in Edgeworthstown, County Longford, Ireland. He did not attend school, but was educated by private tutors at the Edgeworthstown estate until he reached the age to enter university. His father, Francis Beaufort Edgeworth, was descended from French Huguenots and "was a restless philosophy student at Cambridge on his way to Germany when he decided to elope with a teenage Catalan refugee Rosa Florentina Eroles he met on the steps of the British Museum. One of the outcomes of their marriage was Ysidro Francis Edgeworth (the name order was reversed later)...." Richard Lovell Edgeworth was his grandfather, and the writer, Maria Edgeworth, was his aunt. As a student at Trinity College, Dublin, and Balliol College, Oxford, Edgeworth studied ancient and modern languages. A voracious autodidact, he studied mathematics and economics only after he had completed university. He qualified as a barrister in London in 1877 but did not practise. 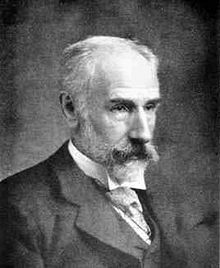 On the basis of his publications in economics and mathematical statistics in the 1880s, Edgeworth was appointed to a chair in economics at King's College London in 1888, and in 1891, he was appointed Drummond Professor of Political Economy at Oxford University. In 1891, he was also appointed the founding editor of The Economic Journal. He continued as editor or joint-editor until his death 35 years later. Edgeworth was a highly influential figure in the development of neo-classical economics. He was the first to apply certain formal mathematical techniques to individual decision making in economics. He developed utility theory, introducing the indifference curve and the famous Edgeworth box, which is now familiar to undergraduate students of microeconomics. He is also known for the Edgeworth conjecture, which states that the core of an economy shrinks to the set of competitive equilibria as the number of agents in the economy gets larger. In statistics, Edgeworth is most prominently remembered by having his name on the Edgeworth series. This book shows clear signs of genius, and is a promise of great things to come... His readers may sometimes wish that he had kept his work by him a little longer till he had worked it out a little more fully, and obtained that simplicity which comes only through long labour. But taking it as what it claims to be, 'a tentative study', we can only admire its brilliancy, force, and originality. Whatever else readers of this book may think about it, they would probably all agree that it is a very remarkable one.... There can be no doubt that in the style of his composition Mr. Edgeworth does not do justice to his matter. His style, if not obscure, is implicit, so that the reader is left to puzzle out every important sentence like an enigma. The Royal Statistical Society awarded him the Guy Medal in 1907. Edgeworth served as the president of the Royal Statistical Society, 1912–14. In 1928, Arthur Lyon Bowley published a book entitled and devoted to F. Y. Edgeworth's Contributions to Mathematical Statistics. In Mathematical Psychics (1881), his most famous and original book, he criticised Jevons's theory of barter exchange, showing that under a system of "recontracting" there will be, in fact, many solutions, an "indeterminacy of contract". Edgeworth's "range of final settlements" was later resurrected by Martin Shubik (1959) as the game-theoretic concept of "the core". As the number of agents in an economy increases, the degree of indeterminacy is reduced. In the limit case of an infinite number of agents (perfect competition), contract becomes fully determinate and identical to the 'equilibrium' of economists. The only way of resolving this indeterminacy of contract would be to appeal to the utilitarian principle of maximising the sum of the utilities of traders over the range of final settlements. Incidentally, it was in this 1881 book that Edgeworth introduced into economics the generalised utility function, U (x, y, z, ...), and drew the first 'indifference curve'. He was the first one to use offer curves and community indifference curves to illustrate its main propositions, including the "optimal tariff". Taxation of a good may actually result in a decrease in price. He set the utilitarian foundations for highly progressive taxation, arguing that the optimal distribution of taxes should be such that 'the marginal disutility incurred by each taxpayer should be the same' (Edgeworth, 1897). In 1897, in an article on monopoly pricing, Edgeworth criticised Cournot's exact solution to the duopoly problem with quantity adjustments as well as Bertrand's "instantly competitive" result in a duopoly model with price adjustment. At the same time, Edgeworth showed how price competition between two firms with capacity constraints and/or rising marginal cost curves resulted in indeterminacy. This gave rise to the Bertrand–Edgeworth model of oligopoly. 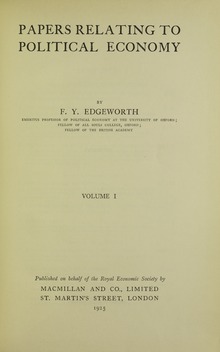 Edgeworth criticised the marginal productivity theory in several articles (1904, 1911), and tried to refine the neo-classical theory of distribution on a more solid basis. Although his work in questions of war finance during World War I was original, they were a bit too theoretical and did not achieve the practical influence he had hoped. Edgeworth's limit theorem relates to equilibrium of supply and demand in a free market. See Edgeworth's limit theorem. Though Edgeworth's economic ideas were original and in depth, his contemporaries frequently complained of his manner of expression for lack of clarity. He was prone to verbosity and coining obscure words without providing definition for the reader. Mirowski, Philip (1994). Edgeworth on Chance, Economic Hazard, and Statistics. Rowman & Littlefield. ISBN 978-0-8476-7751-1. Charles R. McCann Jr. (ed.) (1966) F.Y. Edgeworth: Writings in Probability, Statistics and Economics, 3 vols. Cheltenham, Glos. : Elgar. F. Y. Edgeworth (2003). Peter Newman (ed.). F.Y. Edgeworth : Mathematical Psychics and Further Papers on Political Economy. Oxford University Press. ISBN 978-0-19-828712-4. New and Old Methods of Ethics, 1877. Mathematical Psychics: An Essay on the Application of Mathematics to the Moral Sciences. Kegan Paul. 1881. "Methods of Statistics", 1885, Jubilee Volume of RSS. "Observations and Statistics: An essay on the theory of errors of observation and the first principles of statistics", 1887, Transactions of Cambridge Society. Metretike, or the method of measuring probability and utility, 1887. "Mathematical Investigations in the Theory of Value and Prices," Connecticut Academy, 1892. "The Law of Error and Correlated Averages", 1892, Phil Mag. Entries: "Average", "Census", "Cournot", "Curves", "Demand Curves", Difficulty of Attainment", "Distance in Time", "Error", 1894, in Palgrave, editor, Dictionary of Political Economy, Vol. 1. Entries: "Gossen", "Index Numbers", "Intrinsic Value", "Jenkin", "Jennings", "Least Squares" and "Mathematical Method", 1896, in Palgrave, editor, Dictionary of Political Economy, Vol. 2. "Preface", 1904, in J.R. MacDonald, editor, Women in the Printing Trades. "Applications of Probabilities to Economics, Parts I & II", 1910, EJ. On the Relations of Political Economy to War, 1915. The Cost of War and ways of reducing it suggested by economic theory, 1915. Currency and Finance in Time of War, 1918. A Levy on Capital for the Discharge of the Debt, 1919. Also available as: Edgeworth, F.Y. (1995), "Women's Wages in Relation to Economic Welfare", in Humphries, Jane (ed. ), Gender and economics, Aldershot, England Brookfield, Vermont, USA: Edward Elgar, pp. 99–112, ISBN 9781852788438. Papers Relating to Political Economy, 3 volumes, 1925. "Review of J.M. Clark's Overhead Costs", 1925, EJ. "mathematical method in political economy," 1926, Palgrave's Dictionary of Political Economy, reprinted in 1987, The New Palgrave: A Dictionary of Economics, v. 3. ^ Barbe, Lluis (2010), Francis Ysidro Edgeworth: A Portrait With Family and Friends, Edward Elgar Publishing, p. 1, ISBN 9781849803229, His name was actually Ysidro Francis Edgeworth, but his family and friends called him Francis or Frank, and when he started publishing in 1876 he transposed his Christian names. ^ Barbe (2010), p. 85: "The year 1877 was a productive year for Edgeworth in earning titles. He acquired the degree of Master of Arts from Oxford and was called to the bar by the Inner Temple. This means that he had successfully completed his studies at the professional level. However, by then he had decided not to pursue a legal career." ^ O'Connor, John J.; Robertson, Edmund F., "Francis Ysidro Edgeworth", MacTutor History of Mathematics archive, University of St Andrews . ^ "Alfred Marshall (1881) "Review of Edgeworth's Mathematical Psychics"". Cepa.newschool.edu. Archived from the original on 10 August 2012. Retrieved 20 June 2010. ^ Stigler, Stephen M. (1978), "Francis Ysidro Edgeworth, Statistician", Journal of the Royal Statistical Society, Series A, 141 (3): 287–322, doi:10.2307/2344804, JSTOR 2344804 . See in particular Section 3, "Edgeworth's Style", pp. 292–293. "Archival material relating to Francis Ysidro Edgeworth". UK National Archives. P J FitzPatrick, "Leading British statisticians of the nineteenth century, Journal of the American Statistical Association 55 (1960), 38–70. M G Kendall, "Francis Ysidro Edgeworth, 1845–1926," Biometrika 55 (1968), 269–275. Newman, Peter (1987). "Edgeworth, Francis Ysidro," The New Palgrave: A Dictionary of Economics, v. 2, pp. 84–98. _____. (2001). "Edgeworth, Francis Ysidro (1845–1926)," International Encyclopedia of the Social & Behavioral Sciences, pp. 4170–4175. Abstract. Spiegel, Henry William. The Growth of Economic Thought. Ed. Durham & London. Duke University Press, 1991. Stigler, Stephen M. * (1987). "Edgeworth as statistician," The New Palgrave: A Dictionary of Economics, v. 2, pp. 98–98.